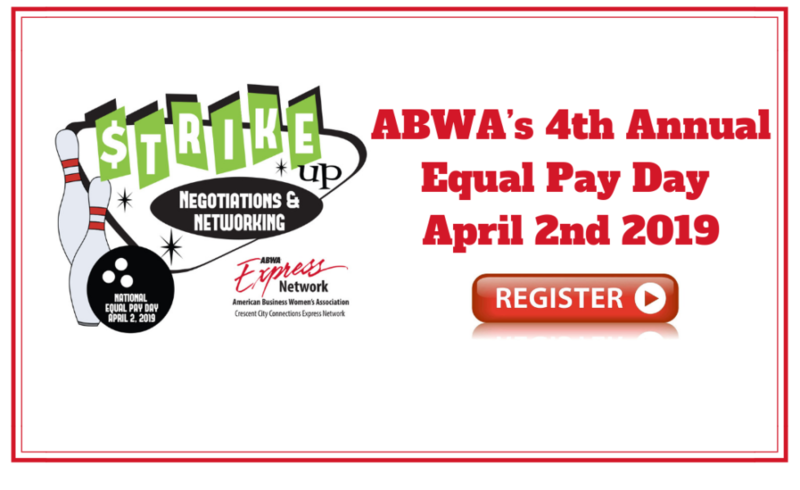 A New Orleans Women’s Business association, ABWA, will champion the Equal Pay discussion for a fourth year in a row! All proceeds will go to benefit scholarships and professional development for business women. Are you earning what you deserve? Based on the latest data (2016), full-time working women in the U.S earned 80% of what men earned…A portion of this gap is attributed to women’s lack of knowledge in how to best negotiate for their pay and benefits. Created for working women, Work Smart is a free interactive workshop that teaches you to evaluate, negotiate, and articulate your worth confidently in the job market. During this workshop we will hold discussions on the gender pay gap and its personal effects, do some small group activities and role-play exercises to give you the opportunity to create and perfect your persuasive pitches. You will learn objective research and benchmarking skills to establish an equitable target pay range, whether you are striving for a promotion, asking for a raise, or negotiating for a position with a new organization or company. Arnedra Jordan wears many hats: she is a mother, a professor, an educator, a PhD candidate, a public health consultant, a nonprofit founder, and an active community member. Arnedra is a dedicated educator who is a professor of Political Science at West Los Angeles College. Arnedra is also continuing her own education and is currently pursuing a PhD in Public Policy and Administration. Arnedra also works as a public health consultant with both the Susan G. Komen Foundation in Los Angeles and with the Center for Disease Control and Prevention (CDC). At the Komen Foundation, Arnedra manages the Circle of Promise initiative, and sits on the Public Policy Advocacy team. Through her leadership, the Komen Foundation has successfully provided over 6,000 mammograms at no cost to women in need. As part of this consulting work, Arnedra links women to preventive health care and social support resources and motivates women to access screening mammograms. Arnedra is an active member of the American Business Women Association. She is currently Chair of the Southern California Council, a Top Ten award recipient and the Director of District six for The American Business Women’s Foundation. The American Business Women’s Association, brings women of diverse occupations together and foster personal and professional growth through leadership, education and networking support. In addition, Arnedra is also a board member emeritus for the Women’s Center of Los Angeles. As a part of this organization, Arnedra created a Scholarship in her Mother’s name, The Beverly Hudson Scholarship which is awarded annually to girls who have completed the Girls to Grads program and want to pursue higher education. Arnedra is the current Chair of Education for the United Nations Association. Arnedra is a certified salary negotiator and provides free workshops that teach women how to negotiate their salary through the American Women’s University where she is a proud member of the Long Beach Chapter.